Tom Cruise is back in the latest explosive blockbuster, but is he getting on a bit? To any naysayers, I must say I really enjoyed Mission Impossible 3 and thought it was a real step forward for the franchise. This is a worthy sequel and with Abrams still on board as a producer, it is a gun-ho action packed piece of pure cinema to really get the blood pumping. The story, much like many of this ilk, is inconsequential. Sawyer from Lost has been killed getting some nuclear codes from A to B or something. America and Russia are in another cold war and it’s up to Tom Cruise to save the day. There are some great set pieces from around the world with all the whistles and stops that come from such a multimillion blockbuster and there’s no doubt you get a lot of bang for your buck. Whether it’s jumping out from a skyscraper, a chase scene in a sand storm, a prison escape or just the edge-of-your-seat tension of trying not to blow your cover (that’s what she said), Mission Impossible 4 ticks all the right boxes. It must be said Cruise still gives it 110% effort and the results are really up there on the screen, his other cast members also make quite a good team all complimenting one another. Jeremy Renner impresses and shows that he can easily be the next Bourne, even Pegg didn’t annoy me which is a first. The villains also might not be of Seymour-Hoffman calibre but still do some scene chewing. Director Brad Bird has also done extremely well for someone who hasn’t done a live action film before, his previous credits being in animation such as The Incredibles and working on The Simpsons for quite a while, and you can’t fault his skill. However, the film did have a few issues. Namely, the pace isn’t as high-paced as the last one, which might be ok but sometimes we don’t need to see every tiny detail that happens with each mission. An example of how this worked before when in MI3 when they are in China, Cruise just suddenly jumps out of a skyscraper from above without the audience seeing anything at all of what happened before. It was a bold move and paid off, however MI4 just carries on the whole ‘here’s the mission, here’s what we have to do, here is us doing it, here’s where it’s gone wrong, here’s how we fixed it’ and then kept to that formula about five times during the film. There were a few surprises but there was nothing that made me think it was taking chances, it was just pure spectacle. Which isn’t a bad thing. The added benefit was also that I watched it in IMAX which is always that bit better than seeing it on a normal cinema. There’s nothing here that will change the world, but the action is top notch and it’s definitely going to make the Bond franchise sit up and take notice again because on all accounts, Mission Impossible is in the lead. Overall, I’d give it an extra mark for IMAX mind-blowing visual candy, but as a film it is good but not great and you can’t go wrong with hopping to the cinema to see it, you’ll be thoroughly entertained. MI 4: Ghost Protocol gifts you a munificent entertainment by lurking your senses in for a sophisticated gizmo treat, peppered with flamboyant action brimming over Soviet-US suspicion of nuclear threat!!! Not raking in the moolah any smug stuff, MI 4 piques applause but more when Tom Cruise plays over ”Burj Khalifa”. 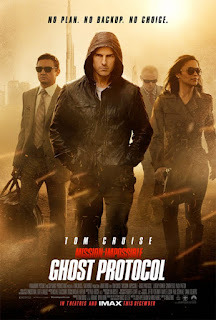 Certainly with no plan, no backup Tom cruise and team eke out accomplishment alluringly !!!! Kudos ,thumbs up, Encore !!! !